January 31, 2012, Center Line, Mich. - For its 75th anniversary, Mopar continues to work its magic. Today at its engineering lab in Center Line, Mich., Mopar revealed four custom vehicles, including the Mopar '12 300, Fiat 500 "Stinger," Mopar Jeep Compass .True North. and Dodge Dart "GTS 210 Tribute". Mopar '12 will be available this summer straight from the factory, while components of the Fiat 500, Jeep Compass and Dodge Dart custom configurations will be available in the fall as stage kits or al carte from the Mopar catalog. "Customization is king," said Pietro Gorlier, President and CEO of Mopar, Chrysler Group LLC's service, parts and customer-care brand. "These head-turning "Moparized" vehicles show how we can go to the next level of personalization. With our best-in-class offerings of parts and accessories, we give our customers every opportunity to further enhance the appearance and performance of their vehicles." 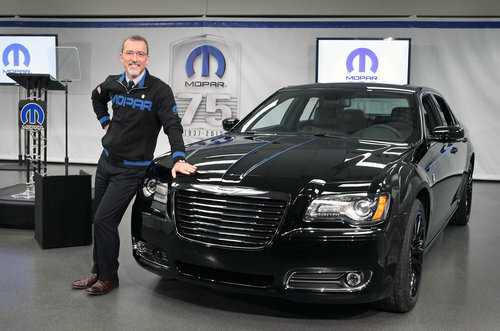 The following "Moparized" vehicles were revealed today and will be on display at the 2012 Chicago Auto Show from Feb. 10-19. Building on the success of Mopar versions of the 2010 Dodge Challenger and 2011 Dodge Charger, the new Mopar '12 300 transforms the Chrysler 300 flagship sedan into a performance tribute to celebrate Mopar's 75th anniversary with unique appointments, select high-performance parts and appearance items straight from the Mopar parts catalog. Mopar earned its factory-designed performance reputation with enthusiasts and the most discerning racing drivers for the past 75 years -- and the new Mopar '12 is designed to showcase the brand's prowess. When looking under the hood of the Mopar '12 300, an exclusive Mopar engine cover hints at the 363 horsepower 5.7-liter HEMI V-8 engine with innovative four-cylinder mode Fuel Saver Technology beneath. Backed with a proven five-speed W5A580 automatic transmission, Mopar aficionados will appreciate the unique Mopar shifter combined with Auto Stick. With Auto Stick, drivers may select a higher or lower gear while the transmission controller helps prevent the possibility of an over-rev condition. At the rear, the differential has been boosted from 3.06:1 to a 3.91:1 final-drive ratio for enhanced acceleration -- unique to the Mopar '12 -- enabling 0-to-60 mph blasts in the low 5-second range. The new Mopar '12 300 features the second-generation E-segment architecture's performance-tuned suspension with 42 percent stiffer front and 23 percent stiffer rear spring rates compared to the Chrysler 300 models with touring-tuned suspension. For improved grip and braking, stickier P245/45R20 Goodyear Eagle F1 three-season tires replace all-season radials, and high-performance brake linings mounted to dual-piston front and single-piston rear calipers deliver fade-resistant stopping performance. 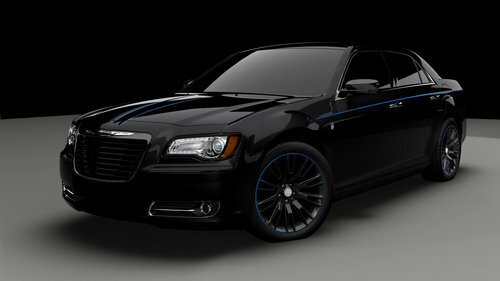 Unique Mopar 300 "Street Machine"
Similar to the new Chrysler 300S models, Mopar '12 300 adds even more street credibility with its blacked-out appearance and unique Mopar appointments. A Mopar Black Chrome seven-bar grille and grille-surround matches the black-accented headlamp bezels and fascia accents for a low-key presence. 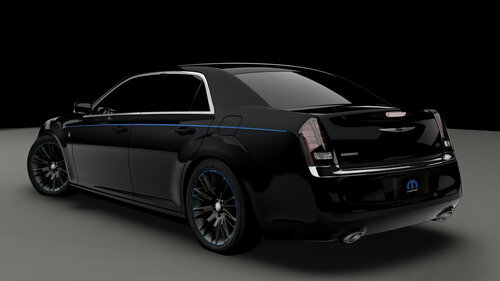 Highlighting the Gloss Black exterior contours of the Mopar '12 300 are a Mopar Blue A-line body-side stripes. Large 20-inch by 8-inch Mopar forged-aluminum wheels are painted in Gloss Black and include Mopar center caps. Commemorating the brand's 75th year, "Mopar 75" fender badges feature the Mopar Blue "omega" logo. On the deck lid, a "Mopar Design" badge hints at the select Mopar parts and accessories that have been infused to enhance performance and distinguish the Mopar '12 300 from any other Chrysler 300. Inside, Mopar '12 300 features a monotone black interior environment with Mopar Blue accents throughout. Mopar's Katzkin perforated leather wraps the large-bolstered 12-way power driver and passenger heated-front sport seats, and includes Mopar Blue accent stitching on the seating surface, along with French-seamed stitching at the perimeter and a black/blue two-tone leather combination. Rear heated seats feature the same perforated leather and corresponding Mopar Blue stitching treatment. A thick-rimmed steering wheel with die-cast paddle shifters (for Auto Stick) and a unique Mopar shifter handle are wrapped in black leather and stitched with matching Mopar Blue thread. Mopar sill plates and a serialized "Mopar '12 Limited Edition" badge complete the list of unique appointments. The enthusiast-designed interior of the Mopar '12 300 is enhanced further with matte carbon hydrographic accents on the instrument panel and center console areas, while Piano Black is used on the interior center stack, instrument panel, steering wheel, gauge cluster and door panel elements to provide a unique lacquered appearance. World-class connectivity with segment.s largest touchscreen display State-of-the-art Uconnect Touch 8.4 provides Mopar '12 300 passengers with the segment.s largest touchscreen display (8.4-inches) and next-generation mobile infotainment, connectivity and multimedia features. In addition, the Mopar '12 300 features a unique "Mopar" start-up screen. Uconnect Touch also controls Mopar '12's 506-watt Alpine nine-speaker premium audio system with subwoofer 12-channel amplifier with 506 watts of power and digital signal processing (DSP) for 7.1-adapted surround sound. SafetyTec Group: Advanced Active-safety features for 360-degree perspective The new Mopar '12 300 provides customers the latest in accident-avoidance features with its standard SafetyTec Group, combining advanced active- and passive-safety technologies for enhanced driver confidence. The SafetyTec Group includes adaptive-forward lighting (AFL), high-intensity discharge (HID) projector high and low-beams with automatic headlamp leveling, Forward Collision Warning (FCW) with adaptive-cruise control (ACC), Blind-spot monitoring (BSM) with Rear Cross Path (RCP) detection, ParkSense front and rear park assist system, LED-illuminated rear fog lamps, exterior mirrors with supplemental turn signals and approach lamp. Additional safety features include a HomeLink universal transceiver, rain-sensing wipers and SmartBeam headlamps. The Mopar '12 300 will be built in Brampton, Ontario. The manufacturer's suggested retail price for the limited-edition Mopar '12 300 is $49,700, which includes $825 for destination. Customers who purchase one of these 500 limited-edition Chrysler 300 models will receive a personalized owner kit in a customized Mopar '12 300 box, Mopar-branded key fobs and Mopar '12 300 merchandise. The kit will include a certificate with the vehicle identification number (VIN), exact date of manufacture and the number of the vehicle. The kit also will include an original sketch of the car signed by the designer and a brochure highlighting the unique features of the vehicle. 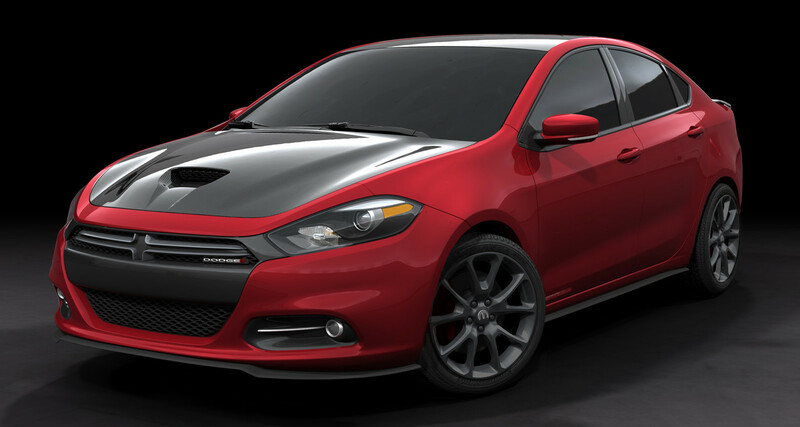 2013 Dodge Dart "GTS 210 Tribute"
Hot off the heels of its worldwide production debut at the 2012 North American International Auto Show, Mopar wasted no time giving the 2013 Dodge Dart even more sporting pretensions both inside and out. 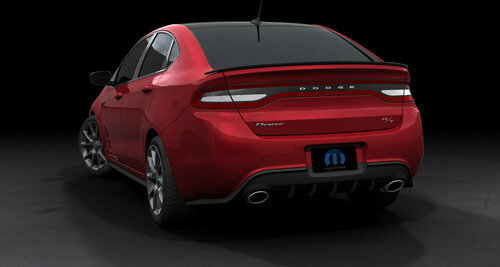 The all-new Dodge Dart embodies class-leading and class-exclusive features in many areas including aerodynamics, technology and safety, and the stage kits by Mopar enhance these attributes. The Alfa Romeo-based Dodge Dart already has sporty driving dynamics baked into its DNA, and Team Mopar added even more distinction to reinforce the car's fun-to-drive nature. Building on the Fiat 500's "Hottest Sports Compact Car" award by the Specialty Equipment Market Association (SEMA) this past November, the new Fiat 500 "Stinger" integrates two Mopar stage kits that deliver bold styling appointments and select high-performance parts from the Mopar catalog. 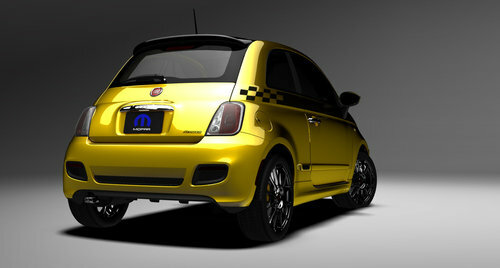 Adding even more style to the new 2012 Fiat 500 Sport, the Fiat 500 Stinger features Giallo (yellow) exterior paint combined with unique blackened exterior and interior appointments -- all designed to amplify the hatchback's athletic Italian styling. For a more aggressive appearance, the Fiat 500 Stinger's signature "whiskers and logo" face and circular projector headlamps are finished in Black Chrome. Accenting the Giallo bodyside are exterior door handles and mirror caps finished in Black Chrome, while larger 17-inch by 7-inch Abarth Hyper Black aluminum wheels with wider 205/40 R 17 performance tires provide the hatchback with a menacing stance below. Tinted head and taillamps and license-plate brow, and Mopar's vinyl bodyside and roof graphics in black checker add to the Fiat 500 Stinger's serious look. 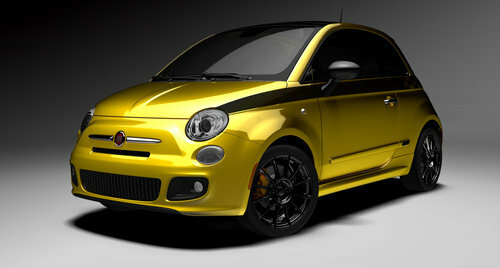 The interior of the Fiat 500 Stinger continues the duality of Giallo and black with Mopar's Katzkin leather seats. Based on the Fiat 500 Sport's athletic-styled seats, the 500 Stinger's seats feature Alcantara seat centers sandwiched by smooth and Giallo black leather bolsters and Giallo accent stitching. Below, a Mopar carbon-fiber instrument panel decal provides this Cinquecento's interior with a technical appearance. A Mopar shifter ball is finished in Gloss Black completes the appearance. Delivering factory-designed performance, Mopar's new Stage 2 kit ensures that the Fiat 500 Stinger delivers improved power and braking capabilities to match its aggressive styling upgrades. Mopar's cold-air intake and free-flowing cat-back exhaust enable the Fiat 500 Stinger's fuel-efficient 1.4-liter 16-valve MultiAir. engine to deliver even more power and torque. 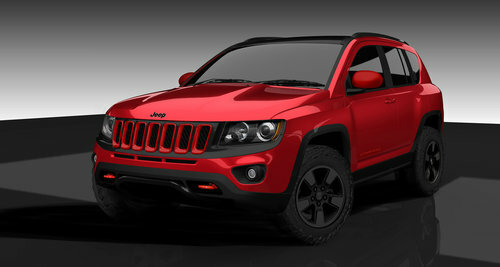 2012 Mopar Jeep Compass "True North"
Like all Trail Rated Jeep models, the Jeep Compass is a capable off-road machine. With the Mopar Jeep Compass "True North" model, Mopar further improves its off-road form and function. The interior received lots of attention from Mopar and renowned audio component manufacturer Kicker. The entire audio system, including front and rear speakers, amplifier, sub-woofer and lift gate speakers are provided by Kicker, and transform Jeep Compass into a rolling high-end sound studio. A custom center stack gauge pod that houses pitch and roll inclinometer gauges, add to the vehicle's off-road credentials. A Mopar bright pedal kit, door-sill guards, rear-cargo tray, shift knob and neoprene seats complement each other while enhancing the quality feel of the cabin. Mopar (a simple contraction of the words MOtor and PARts) was trademarked for antifreeze in 1937. The Mopar brand made its mark in the 1960s -- the muscle-car era. The Chrysler Corporation built race-ready Dodge and Plymouth "package cars" equipped with special high-performance parts. Mopar carried a line of "special parts" for super-stock drag racers and developed its racing parts division called Mopar Performance Parts to enhance speed and handling for both road and racing use.